Greetings from Ramgarhia Polytechnic College!!! It gives us immense pleasure to bring you inform that " Joint Mega Job Fest 2017" to be organized by Ramgarhia Polytechnic College along with Ramgarhia Institute of Engineering & Technology ,Phagwara on 05th & 06th April 2017. 2016 Pass outs & 2017 Passing out. 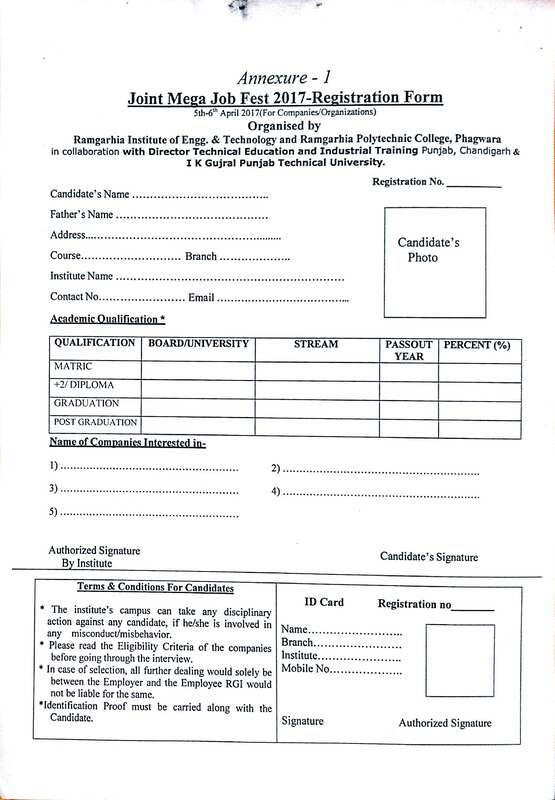 Students who are interested to participate in JOINT MEGA JOB FEST are requested to kindly bring hardcopy of this registration form along with them after filling it properly and this form should be duly attested by respective institution' s TPO . · Only registered candidates will be allowed to participate. · No registration and participation charges. o 5 photocopies of testimonials. For further queries, we remain at your disposal. We sincerely hope that students will make the best use of the opportunity and we together can make a difference. College authority is not responsible for transportation, boarding & lodging of any Student.